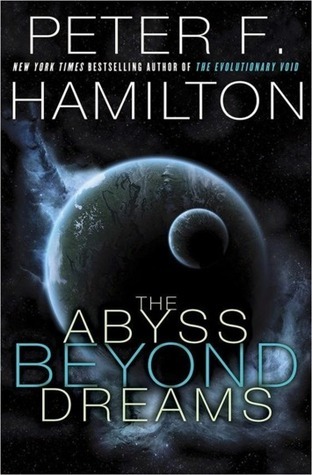 I should preface this by saying that The Abyss Beyond Dreams is the first Peter F. Hamilton book I’ve read. So, I can’t really speak to the extent to which it incorporates the rest of his world. Hamilton’s novel features The Void, a black hole in space that seems to be exerting a conscious will. When a Commonweath fleet is absorbed into the Void, Nigel determines that he must go in after it and rescue the Void’s captives. He arrives to find a fully established planet, Bienvenidos, with a governmental system and religion already taken hold. Time works differently in the Void. In order to save them, he’s going to have to do a lot of work. Meanwhile, Slvasta is an ambitious military officer. He’s seen existential threats to Bienvenidos and is dedicated to keeping the planet and its people safe. His dedication teeters on the verge of obsession. When the planet’s government doesn’t take his advice, he becomes wrapped up in political intrigue that threatens a full-blown and violent revolution. The world that Hamilton creates is extremely rich in detail. The descriptions of the planet, space, and the people are very vivid. He develops a believable and nuanced political system in which most of the plot takes place. It was all-encompassing. Some of the technology was a bit overly convenient. They know that the Void breaks down technology very quickly and interferes with its ability to function. Knowing that, they bring bio-tech in when Nigel leaves. Despite his presence on the planet for decades, there doesn’t seem to be any degradation of the tech. This to me seemed weird. Then it would often be that the bio-tech was extremely useful. It wasn’t too big of a deal, but it was just a bit strange. Note: I received a copy of this book for free via NetGalley. This entry was posted in Reviews and tagged Abyss Beyond Dreams, Book Review, Books, Fallers, Nigel, Peter F. Hamilton, Science Fiction, Slvasta, The Commonwealth.